Today’s guest spot comes from a good friend and flawless creature. Olivia and I started out working on a project together, but a year later, I feel like I can call her a friend, even if she does want to choke me sometimes (she does. Don’t listen to her if she says otherwise). For me, food is fair game. I’m fortunate enough not to have encountered medical reasons for avoiding foods, and the only reason I won’t eat something is because it’s probably a banana. That’s not the case for everyone, though, and Olivia recently learned she needed to go gluten free, cut out sugar, and ditch dairy. Keeping these things to a minimum is probably good for any of us, but in her case, it was an autoimmune disease that made it less an option and more of a demand. It’s true. Would most people grab a bean brownie if the didn’t have to? Probably not, and according to Olivia and countless other people, most people would be missing out. Today, Olivia introduces us to a handful of her favorite snacks, urging us all to try something different. A number of these companies also give back to their communities, battling hunger and increasing food access around the world, and as we know at Wait! I’ll Eat That, those are pretty important issues. Take a look below and try some gluten free snacks that are tested and Olivia-approved, whether you’re actively eliminating gluten from your diet or you just need snacks that aren’t the same old thing. Note: Each snack has an editor’s note, courtesy of me, but the opinions, reviews, and product descriptions are Olivia’s. Gluten-free living or the term “gluten free” has seen a sudden increase in interest over the past couple years. More and more people are choosing to make a lifestyle choice to remove all gluten from their diets as a way to better their overall wellness. Others (like me) have to part ways with gluten due to health reasons and adopt a gluten-free way of life. As a 21-year old Italian woman, you could imagine gluten was basically running through my veins. Before being diagnosed with an autoimmune disease, I would enjoy the occasional plate of pasta, pita chips with hummus, or slice of bread before dinner at a restaurant. After consuming these foods that contained gluten, I would feel uncomfortable, with stomach bloating, stomach pains, and low energy. Now that I’ve finally figured out why I was feeling all those symptoms (because of my autoimmune disease), I have been on a gluten-free diet for a little over 6 months. I’ve also chosen to remove sugar and dairy products from my diet in an effort to improve my health overall. Since removing gluten, I’ve started to see massive changes in my health and my body. Now I feel like I have more energy throughout the day, and I don’t get striking stomach aches and pains. Also, my overall complexion is a lot brighter and healthier. Now that I see the benefits of what removing gluten can do for me, I don’t think I would ever re-introduce it into my diet. That still doesn’t mean I don’t miss some of the snacks that I used to eat before going GF. Those who know me personally understand I am the true essence of the word “foodie,” so I made it a goal of mine to find tasty and healthy snacks that were safe to eat. Even though these brands remove gluten from their foods, they still rely heavily on these four toxic “food groups” to mimic the food’s original state with gluten. As you can see, corn is used heavily in the gluten free industry as an alternative to wheat, but excess amounts of corn can be unhealthy to the body. Me, the corn chip lover, not having corn? What else can the gluten monster take from me!! But in all seriousness, it’s always important for me to clearly read the labels of the foods I was consuming to make sure I wasn’t adding harmful ingredients into my diet that were never really present in my diet before. Now, lets get to the snacks! I am proud to say that I have successfully found healthy alternatives to the foods I used to snack on and to top it all off, I would say most of the products I’m about to share with you taste WAYYY better than anything that has gluten in it. Shall we? I’m known as the chip queen in my family because I’ve never met a chip I didn’t like. However, most of the chips I used to grab handfuls of were not safe for me to eat. The good old days of grabbing guilt free handfuls of crisps are back, thanks to these Beanfields Sea Salt and Bean Chips. They satisfy that crunch you look for in a chip and with only 4 simple ingredients – brown rice, beans, oil, and salt, I don’t even feel bad if I end up eating the whole bag! Beanfields also contributes chips to local nonprofits and community groups all over the Us and Canada, which is awesome! I know I keep talking about finding the right “crunch,” but it really is something that’s highly sought after once the days of crunching into a freshly toasted piece of Italian bread are gone. Now I’m not saying these Mary’s Gone Crackers snacks can compare to freshly baked Italian bread, but they for sure satisfy that crunch. I’ve been snacking on these crackers long before I went gluten free, which really shows I haven’t just convinced myself they’re good – they’re actually good! They’re perfect for dipping into hummus or tapenades, and they have a weirdly addicting hint of peppery undertones. A few of these crackers with some homemade hummus is one of my favorite go-tos. The brand’s motto is all about taking action and joining the movement of conscious eating, which I really appreciate. 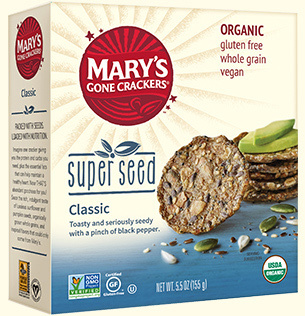 Editor’s Note: Mary’s Gone Crackers is an advocate for conscious eating, with an inspiring mission statement that stresses knowing how your food is made and what impact its consumption has on the world around you. The company has partnered with a number of organizations committed to conscious eating, understanding the power of working together to promote a world in which what we eats impacts more than ourselves. This brand is so unique and their slogan, “real and upfront,” couldn’t be closer to the truth. 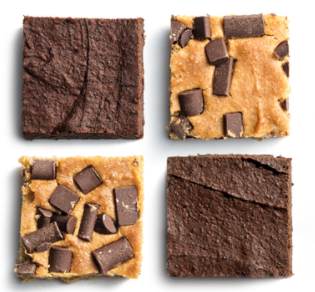 RXBAR is honest about everything they do, and they provide their consumers with real food. For those of you not familiar with these bars, I’ll tell you right now – you’re missing out. I went through a period where I would crave the blueberry flavor because I just loved the texture and the natural sweetness that comes from the dates and cashews. Each bar contains 3 egg whites, 6 almonds, 4 cashews, 2 dates, and “no B.S.” (their words, not mine…). These bars are perfect if you’re on the go and looking for something that will fill you up and provide healthy proteins, fats, and carbs. I like to eat these after a workout. If I’m in a pinch, I might eat one as a meal replacement. You can’t go wrong with any of the flavors, but I definitely recommend the blueberry. 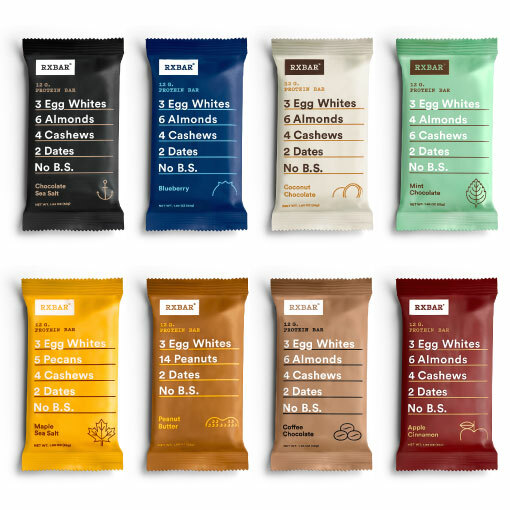 Editor’s Note: RXBAR’s The Real introduces you to real people who have embraced the company’s philosophy of “real and upfront” in their own lives and consequently improved the quality of the lives of others. Read inspiring interviews with Dana, Matthew, Mike, and Emily, and be sure to visit often as they add more empowering and empowered people to the list. Now let’s get back to chips! 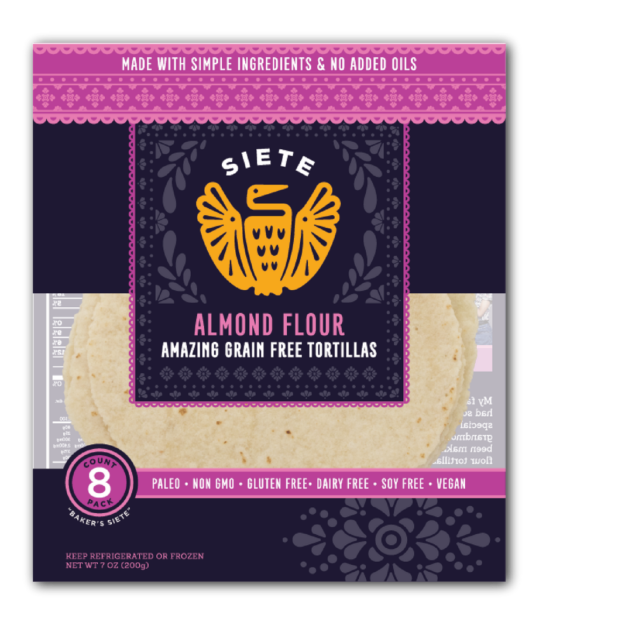 I recently discovered Siete’s products because I was looking for an alternative to corn chips and tortilla wraps for when I’m in the mood for Mexican food. 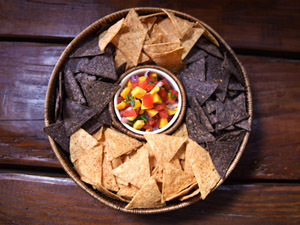 These Siete Sea Salt Tortilla Chips are like nothing I’ve had before – I’m addicted. Exhibit A: as I write this post, there’s a large bag of Siete Sea Salt Chips sitting right next to me. They’re so smooth, crispy, thin, and light, which are all things I look for in the perfect chip. What’s so interesting about these chips is that they use cassava flour, which is a mineral rich root vegetable, coconut flour, avocado oil, chia seeds, and salt to make these little pieces of heaven. This was the first time that I’ve seen cassava flour in a product, but it’s used in Latin America, Africa, and Asia. Siete also makes really tasty Almond Flour Tortilla wraps for when it’s #tacotuesday. I used to just eat a deconstructed version of a taco before I came across these Siete wraps. I recommend warming them up in the oven or over a flame before you pile on the taco meat, salsa verde, some fresh veggies, and cilantro! They become soft, buttery, and oh so delicious. Something else I love about this company is they donate 100% of their apparel profits to nonprofit organizations that align with the company’s mission of promoting health and wellness among underserved communities. Editor’s Note: Siete’s Garza family will move you to love the world a little more. If they don’t, you’re a monster. Veronica Garza founded the company with the help of her family after facing a number of health challenges. Her concerns echo Olivia’s concerns about what to do when you miss the foods you love and grow up with. Their blog, complete with recipes and interviews with consumers, will keep you coming back for daily food-based inspiration. Siete’s superpower is a focus on the importance of what you eat as well as how you eat it. I’m guessing from the title of this last snack you’re a little bit confused about how brownies can fit into this whole gluten free equation. Normally with a brownie the recipe calls for flour, but not with these little squares of delight. These brownies are – wait for it – bean based! Now I know that this may sound a little weird, but trust me when I say these are so rich and fudgy. You would never know you’re eating a brownie made of beans. They’re 100% plant-based (vegan), nut-free, non-GMO, and made with delectable Cocoa Powder, which creates that deep chocolate taste. There are no GF rules being broken here with one of these brownies! Editor’s Note: If you live in New York City, Rule Breaker will bring you free brownies. Really. They’re more than that, however, with an emphasis on their products being “school-safe.” This means you never have to worry about allergies in your kids or in their classmates when you send Rule Breaker brownies in their lunches. They’re also working on their Non-GMO certification, which you can keep up with on their news page. I hope I encouraged you to get out of your foodie comfort zone and try some of these incredibly delicious gluten free treats, even if you aren’t gluten free. I can confidently say the misconception that “gluten free foods don’t taste good” was 100% debunked! Feel free to check out my blogs – Liv For Luxury and The Vanity Files where I discuss all things fashion and beauty. It’s your source of inspiration – mixing timeless basics with hints of the season’s latest trends and reviews of the industry’s best beauty products. Make sure you visit Olivia at Liv For Luxury and The Vanity Files. Also, tell us in the comments what you like to snack on! If you want to be featured in a guest post, I’d love to have you stop by! Drop me a note over at the contact form and let me know if you’re interested! Otherwise, this will just be my friends telling you about tacos, half-smokes, donuts, and quinoa. Nobody wants that.